12 February 2019: Martine Aubry has been the mayor of Lille in northern France since 2001. Twice she was re-elected, most recently in 2014. During the last 17 years after the decline of manufacturing, the city has re-invented it self a European centre of technology, science and culture. Mayor Aubry believes that a vibrant culture will help to attract modern technology and creative industries. It will encourage start-ups to choose Lille as their base. When in 2015 millions of people fled the war zones of the Middle East, Lille was among the first cities in France to welcome refugees. Under Mayor Aubry’s leadership, Lille has remained a welcoming city. In 2018 she invited a group of Sudanese refugees from the Aquarius human rescue vessel after it was denied access to Italian ports. During much of the 1990s, Martine Aubry was Minister for Employment when, in 1998, she was instrumental in introducing the 35-hour working week. Between 2008 and 2012, the Mayor was also leader of the French Socialist Party, but was unsuccessful when she sought her party’s candidature for the 2012 presidential election. 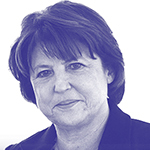 Martine Aubry believes that cities are best placed to respond to the challenge of climate change and is critical of the French government’s timidity. Lille was an early signatory of Agenda 21, the UN’s non-binding action plan to further sustainable development. Mayor Aubry is currently leading her city’s bid to be the 2021 European Green Capital. I think that all the nominees for the World Mayor Prize will share my belief that a mayor’s mandate is the greatest of all mandates. After all, what other mandate allows one to hold a long term vision for the future of a territory, and at the same time to interact closely with residents each day to accompany them, especially those that are the most vulnerable? It is with this double ambition, to look towards the future whilst remaining attentive to each resident, that I have dedicated my work to Lille since I was elected Mayor in 2001. My vision for Lille has always been based on a certain ideal of togetherness and of course, on the values of justice and solidarity. With these values, we defend the design of a city that deliberately turns its back on urban mechanics that divide and alienate. Rejecting city designs with the rich neighbourhoods on one side and the poor neighbourhoods on the other, where the outskirts are dormitory towns and the centres museums and commercial areas, industrial zones, etc.